Oliver installs radiant barriers in attics and are experts in saving energy through your attic, as well as many other parts of your home. If you’ve ever gotten into your car after it’s been sitting in the summer sun for an hour or so, you know firsthand just how hot the car can get. Leather seats can literally make you jump, and it can take your car’s air conditioning quite a while to make the space comfortable again. Why would a car’s interior get so much hotter than the air outside? Because of radiant energy from the sun — solar heat that keeps building up inside of your car. 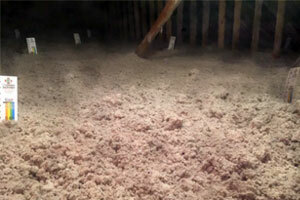 During the summer, the air in your attic can become super heated, just like the air in your car. As the temperatures shoot up to 120, 130, 140 degrees or higher, your home heats up dramatically. This forces your cooling system to work harder than ever. Your electricity use spikes, and you spend a lot more money. Radiant barriers are sometimes referred to as “reflective insulation” and “radiant barrier insulation” because, similar to insulation, they can effectively slow the transfer of heat. By installing a radiant barrier across the rafters, your attic stays cooler and so do you. A radiant barrier in an attic can reduce air conditioning expenses by 10 percent or more. Unlike foam or cellulose, however, radiant heat barriers reflect heat back to its source. Radiant barriers are available in several forms. Your Oliver consultant will help you decide on the one that’s best for your home. In an attic, the radiant barriers we use can work just like these shiny car shades. When it’s hot, up to 97% of the sun’s heat can be reflected back outside by a radiant barrier. This will reduce the heat gain and take a load off of your air conditioning. In the winter, this reflective effect works the other way, reflecting heat from the house back toward your living space. As the local experts for home insulation, Oliver offers professional radiant barrier installation and specializes in a variety of insulation solutions. Call 1-877-757-1141 today, or Schedule A Free Estimate.